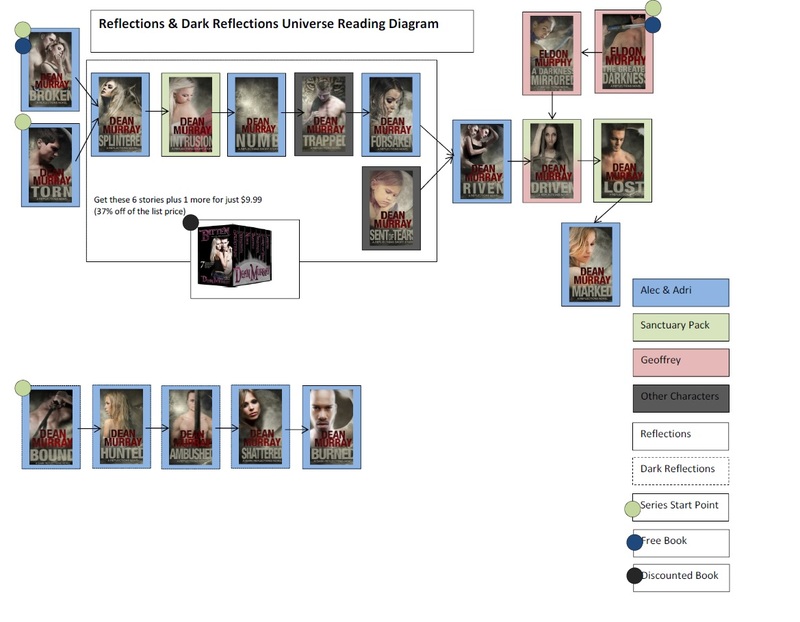 The Reflections Universe is wonderfully complex, but that sometimes means that people have a hard time figuring out what order to read things in. The diagram below should help illustrate the suggested reading order. You’ll notice that there are currently four start points to the series, all of which are equally valid. That isn’t to say that Broken is completely action-free or that Bound doesn’t have any romantic elements–all of my books have some of both. In spite of being able to start reading the Reflections Universe from any of 4 points, generally I recommend that people follow the following sequence. Broken/Torn, Splintered, Intrusion, Numb, Trapped, Forsaken, Riven, The Greater Darkness, A Darkness Mirrored, Driven, Bound (Dark Reflections #1), Hunted (Dark Reflections #2), Ambushed (Dark Reflections #3), Lost, Shattered (Dark Reflections #4), Marked, Burned (Dark Reflections #5), Left. For those people who start with Bound, I generally recommend the following reading sequence: Bound (Dark Reflections #1), Hunted (Dark Reflections #2), Ambushed (Dark Reflections #3), Broken/Torn, Splintered, Intrusion, Numb, Trapped, Forsaken, Riven, The Greater Darkness, A Darkness Mirrored, Driven, Lost, Shattered (Dark Reflections #4), Marked, Burned (Dark Reflections #5), Left. When I wrote Broken and Torn, I used the mechanism of two different viewpoints telling the same story as a way of adding more depth to Adri’s story than I could have with almost any other vehicle, but in spite of how happy I am with how Broken and Torn turned out, I kept wishing there was a way to add even more depth into the storyline. I think the way that small and big events articulate together to influence the course of our lives is fascinating, and I knew that there was a particular character in Adri’s world—one who hadn’t even been introduced yet—who had influenced her life in almost unimaginable ways. I wanted to do that character justice, and although it took me some time to come up with the right vehicle, I eventually realized that the answer had been staring me in the face the entire time. The best way to show just how important someone is would be to write something showing what life would have been like without them. I needed to write an alternate timeline—so I did. 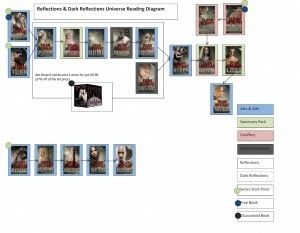 I wrote the Dark Reflections series, of which Bound is the first book. Comic book writers have been doing this kind of thing for ages, but this was something pretty new for me, and the deeper I got into the Dark Reflections books, the more excited I became about the possibilities writing in an alternate timeline offered. The Reflections series has some pretty amazing heroes and some incredibly dark villains, but with many of them, all it would have taken is a slight push to have a character end up on the opposite side of the battle—only before this there hadn’t been a way for my readers to know that. Bound—and the rest of the Dark Reflections books—gives me a way to show you what would have happened if the Sanctuary Pack hadn’t splintered into two bitterly warring factions. It lets me explore hidden sides to some of my favorite characters and redeem people most of my readers never realized deserved redeeming, but even more than that, it lets me show you just how important one yet-to-be-identified character really is to Adri’s life and the lives of her friends.